Lyceum Alpinum won the 29th Cricket on Ice tournament (18-20.2.2016) with three wins from three against St. Moritz CC, Cossonay CC & Old Cholmeleians. Ground preparations took place in splendid sunny alpine conditions. However, it was soon discovered that the Lyceum Alpinum, although delivering the mat, cricket equipment and stumps in plenty of time, had forgotten to bring the nails used to secure the matting to the ice. After a 20 minute, delay while the van dashed off back to Zuoz to return with the nails and a hammer, the tournament was able to start, resulting in a narrow 12 run win for Old Cholmeleians, the English tourists, over the hosts St Moritz Cricket Club. That same afternoon the hosts posted an easy 9 wicket victory over tournament debutants Cossonay Cricket Club from the Suisse-Romandie. On day two of the tournament Old Cholmeleians & Cossonay began the day with a surprising one-sided affair resulting in a 3 wicket victory for Cossonay. In the afternoon the weather conditions deteriorated somewhat and in a game interspersed with snow showers the Lyceum Alpinum beat their hosts & neighbours St Moritz. With all teams with one victory each, the tournament was wide open at the start of day three. The Lyceum beat the Old Cholmeleians quite convincingly, meaning that the afternoon game against Lyceum & Cossonay was in effect the tournament final. Cossonay posted 99 runs in their allotted 20 overs which proved insufficient, Leroy Anderson hitting the only six of the tournament to win the match by 4 wkts with 2 balls to spare. 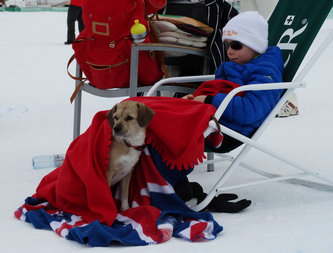 Re-live twenty minutes of action from the first match of the Cricket on Ice Trophy 2016, St Moritz CC v Old Cholmeleians. The camera was worn by international amateur umpire Alexander Mackay, President of Cricket Switzerland and Vice-President of St Moritz Cricket Club & Winterthur Cricket Club. On Saturday evening the tournament black-tie gala dinner took place at Hotel Steffani in St Moritz. The evening was compered by John Zani (OC). 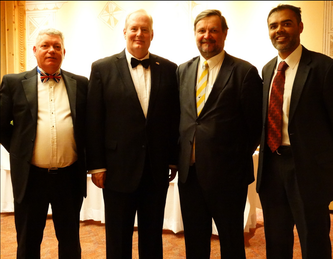 After a short speech by the SMCC President, Mr. John Hallam thanking the organisers & sponsors, keynote speaker the HM Ambassador to Switzerland, Mr. David Moran, addresssed the guests. David spoke of the role sport plays in the integration & bringing together of nations. He also spoke of the importance of the economical ties between the two countries and the historical relationship between Britain and Switzerland, in particular St Moritz, where winter-tourism was estabished by the two nations. Lyceum were presented the trophy, while the champagne moment went to Chris Lodge (SMCC) for a stunning catch on the first day and the golden duck was jointly awarded to two individuals, one for two successive ducks and the other for a diamond duck on his debut in this event. 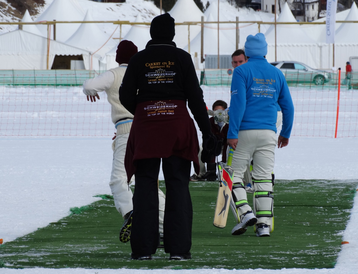 Cricket on Ice 2016 featured on the from cover of "Aktuell", Engadine's events & calendar programme. The Cricket on Ice Trophy also featured in the "Engadiner Post" on Saturday 20th February, the "Tages Anzeiger" on Monday 22nd February and on the BBC World Service Radio's "Stumped" on Saturday 27th February 2016. Photographs of this year's Cricket on Ice are available in the gallery and from the Cricket on Ice website.